Bobbie Skukowski, MS, APRN-BC, BC-ADM - Bond Clinic, P.A. Bond Clinic, P.A. Bobbie Skukowski, APRN is a certified diabetes educator through the American Association of Diabetes Educators and serves as the program coordinator and educator for the Bond Diabetes Clinic. 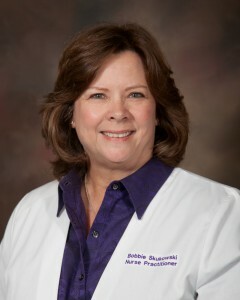 Mrs. Skukowski works in Dr. Miller’s Endocrinology & Diabetes practice and began her career in nursing in 1980. Bobbie joined Bond Clinic in 1993.